Welcome to the AuBlog Wiki! Anyone can login to GitHub to edit this page to add or change the user guide. AuBlog is a colorful Blogger client which lets you publish and draft blog entries for your BlogSpot or Blogger site. It offers an interactive draft tree so you can work on multiple entries at once (try out the web version here: http://aublog.net/webinterface/view_draft_tree.html). AuBlog is designed to take dictations while you are somewhere with no internet connection (ie, can't use Google Voice for dictation) and build these dictations towards a new blog entry, or work on many entries concurrently. You might never publish some of those drafts, but you always have access to them. (There's a button to email your drafts to yourself, or export them in the Settings so that you'll never lose your thoughts). 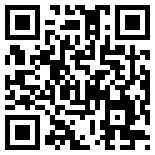 Click here to install AuBlog on your Android. 90% users will prefer the Official Blogger client, it has a lot more features than AuBlog. I developed AuBlog so I could blog while biking to work. If you also work on blog entries while walking, biking, cooking, etc or in other situations where you cannot type, but you can talk, AuBlog might be for you. 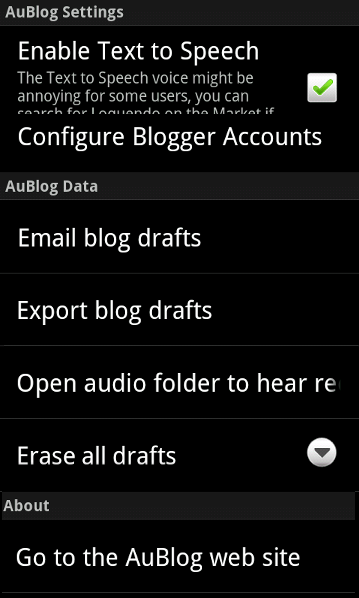 AuBlog Works on well on small screen phones and larger screen tablets too. According to reviews the Official Blogger Client doesn't work well on tablets, but the Blogger website itself is good on tablets. Cunningham H., Maynard D., Bontcheva K. and Tablan V. (2002). "GATE: A Framework and Graphical Development Environment for Robust NLP Tools and Applications." Proceedings of the 40th Anniversary Meeting of the Association for Computational Linguistics. Willie Walker, Paul Lamere, Philip Kwok, Bhiksha Raj, Rita Singh, Evandro Gouvea, Peter Wolf, Joe Woelfel. (2004) Sphinx-4: A Flexible Open Source Framework for Speech Recognition. SMLI TR2004-0811 White paper, Sun Microsystems inc.
Witte, R., and T. Gitzinger. (2009). "Semantic Assistants - User-Centric Natural Language Processing Services for Desktop Clients" 3rd Asian Semantic Web Conference (ASWC 2008), vol. 5367, Bangkok, Thailand, Springer, pp. 360--374, Feb. 2--5, 2009, 2008. For an editable version of the user Guide where you can add information, check out our Wiki. On this screen you can navigate your previous blog posts (published and unpublished). Instead of a list of drafts, its presented as a tree so that when you change your post, a new "daughter" is saved under that post. It might be confusing when you start, but it can also be really helpful to "rewind" to a previous version, or to start a new direction off the same post. AuBlog starts with some sample entries so you can see what the Drafts Tree looks like. The Tree shape is probably most useful if you are blogging via speaking. Sometimes you listen to what you recorded and you decide "branch" out in another direction. This is why a tree is more useful than a list. On this screen you can type (or use Google Voice to dictate sentence by sentence). This is basically the same interface that you would have on any other Android Blogger client. You can use WYSIWYG editing by selecting text then clicking on the buttons to make it bold, underlined etc. To preview the marked-up version, click on the Preview button with the green checkmark. It will open up the preview pane below the edit area. The Edit screen also lets you record long dictations. The dictations are saved in an audio folder on the SDCARD so that your thoughts don't "disappear into thin air." You can listen to them again, or do with them as you wish. (Go to the Settings screen to Open the audio folder). 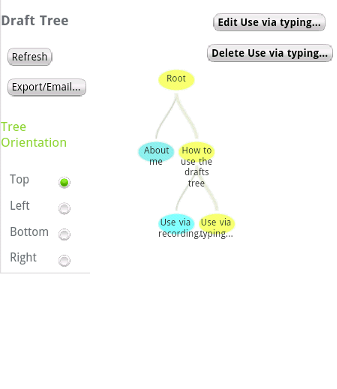 AuBlog attaches them to the draft tree so that you can listen to your drafts in the order of their "family tree". On this screen you can add your Blogger account so that you can publish your blog entries. On the settings screen you also have other options like exporting your drafts, turning Text to Speech (TTS) on or off. AuBlog can read your blog entries to you when you click saveif you are) this way you can use AuBlog "eyes free" when its difficult to look at the screen (while walking, in direct sunlight etc). AuBlog is designed to take notes while you are somewhere with no internet connection (ie, can't use Google Voice for dictation), and you want to build towards a new blog entry, or work on many entries concurrently. You might never publish some of those drafts, but you always have access to them. (There's a button to email your drafts to yourself, or export them in the Settings so that you don't lose your thoughts if you lose your Android or you stop using AuBlog). 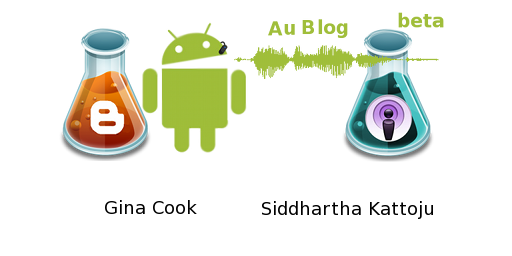 Ideally AuBlog is designed to help you go from Notes to Blog + Podcast with minimal typing. AuBlog wants to transcribe your dictations for you so that you have the least amount of typing to do. Currently this is only possible by sending the audio to a server, and getting back some transcriptions. We are working to integrate a couple of Open Source projects to make this work on the phone itself, but be for-warned, you will still have to do some corrections to make the transcription actually match what you said. Usually these machine transcriptions aren't that good.